View images from this exhibition. Global Textile Trades explores all these aspects of trade from the craft of creating cloth from fibers and yarns to the skill of decorating that cloth through patterns of weaving, dyeing and embroidery techniques. Trade as exchange happens not only in the buying and selling of goods, but also in the exchange of cultural aesthetics and ideas. The international trade in textile products over the past several hundred years is evident in Indian influence in the textiles of Southeast Asia and Europe, and European influence in the textiles of Asia and Africa. 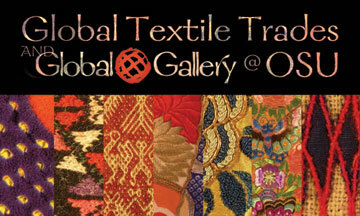 Finally, trade in its most traditional aspect of buying and selling can be experienced in the Global Gallery @ OSU store in the lower gallery space. 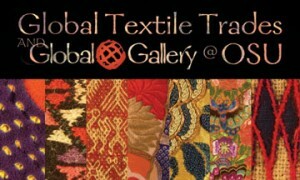 Global Gallery is a local Fair Trade retailer with locations in the Short North and Clintonville that has set up a laboratory store partnership with the Fashion and Retail Studies program. Fair trade provides under- and unemployed artisans from around the world with an opportunity to earn vital income and improve their quality of life by establishing a sustainable market for their handcrafted products.